For other people named Bill Cartwright, see Bill Cartwright (disambiguation). James William "Bill" Cartwright (born July 30, 1957) is an American retired NBA basketball player and a former head coach with the Chicago Bulls. A 7'1" (2.16 m) center, he played 16 seasons for the New York Knicks, Chicago Bulls and Seattle SuperSonics, helping the Bulls capture consecutive championships in 1991, 1992 and 1993. He attended Elk Grove High School in Elk Grove, California, and played college basketball at the University of San Francisco. As a prep star, Cartwright was just as highly regarded as fellow preps Darryl Dawkins and Bill Willoughby. 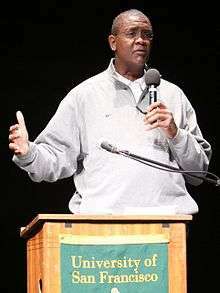 Cartwright played college ball at the University of San Francisco and was a consensus second team all-American in 1977 and 1979. He graduated as the all-time leading scorer for the Dons, averaging 19.1 points and 10.2 rebounds per game. Cartwright led San Francisco to three trips to the NCAA tournament, to the first round in the 1977 and to the Sweet Sixteen in both 1978 and 1979. Cartwright was the third overall pick in the 1979 NBA draft selected by the New York Knicks. As a member of the Knicks, he made his only career All-Star Game appearances in his rookie year of 1979–80. Cartwright averaged more than 20 points per game in his first two seasons for the Knicks. His playing time decreased during his time in New York, initially due to injury (he suffered four separate fractures to his left foot) and then due to the arrival of number-one pick Patrick Ewing which changed Cartwright's role to that of a backup center. On June 27, 1988, Cartwright was involved in a trade between the Knicks and Chicago Bulls, which included sending Cartwright to Chicago and Bulls forward Charles Oakley to New York. The Bulls needed a tall center to counter the size in the Eastern Conference, and to complement Michael Jordan's scoring and Scottie Pippen's defense. The Bulls were willing to part with Oakley, the league's second-leading rebounder in the 1986–87 and 1987–88 seasons, because of the rapid development of Horace Grant. Three years later, he helped the Bulls win their first NBA championship under the head coach Phil Jackson, himself a former Knick, defeating the Los Angeles Lakers in the 1991 NBA Finals. The Bulls went on to win the NBA title again in 1992 and 1993 with the same core team. Jordan retired after the 1992–93 season, and the Bulls were defeated by the Ewing-led Knicks in the 1994 NBA Playoffs. As a member of the Bulls, he took an elbow to the throat during a game against the Indiana Pacers. As a result of a damaged larynx, he now has a very hoarse voice. Cartwright left the Bulls as a free agent and signed with the Seattle SuperSonics. He only played in 29 games for the Sonics, and retired after the 1994–95 NBA season. A few years after his retirement, Cartwright was added to the Bulls once again as an assistant coach under Phil Jackson, and the team was once again in the playoffs, winning the title in 1997 and 1998. The Bulls went through significant changes following the 1997–98 season, with not only Jordan and Pippen leaving, but Tim Floyd taking over as head coach from Jackson. The Bulls had a lengthy rebuilding effort, and Cartwright took over the Bulls 27 games into the 2001–02 season, going 17-38 after the team's 4-23 start under Floyd and interim head coach Bill Berry, the latter whom coached for two games before Cartwright was named interim head coach. The Bulls finished 21-61 on the year and the following season Cartwright was promoted from interim to permanent head coach. In the 2002–03 season the Bulls finished 30-52, but Cartwright would last only 14 games into the 2003–04 season — going 4-10 — before being fired. Pete Myers and finally Scott Skiles coached the Bulls immediately following Cartwright's tenure. In 2004, the New Jersey Nets hired Cartwright as an assistant coach under Lawrence Frank. In 2008, Cartwright was named as an assistant coach for the Phoenix Suns under Terry Porter. Suns general manager Steve Kerr hired the former big man to help coach veteran big man Shaquille O'Neal, all-star Amar'e Stoudemire, and upcoming draft picks. After the Suns dismissed Porter and promoted assistant Alvin Gentry, Cartwright stayed on as assistant coach with the team. In January 2013, Cartwright was hired to coach Osaka Evessa in Japan. In September 2014, Cartwright was hired as the head coach of the Mexico National Basketball Team. Cartwright married his junior high school sweetheart, Sheri, and together they have four children. He obtained a master's degree in organization development and as hobbies, plays guitar and collects transistor radios. ↑ "CARTWRIGHT LIKELY TO BE LOST FOR SEASON". NY Times. 19 December 2013. ↑ Brown, Clifton. (May 19, 1989). "Cartwright Handling Ewing in Pivotal Matchup". The New York Times. Retrieved June 16, 2015. ↑ "YEAR-BY-YEAR HISTORY OF THE CHICAGO BULLS". NBA.com. Retrieved June 16, 2015. ↑ "Bill Cartwright -- Elbowing Way To Top -- When Sonic Center's Around, Foes Have A Lot To Think About". The Seattle Times. 19 December 2013. ↑ "Cartwright Relieved as Bulls Head Coach". NBA. 19 December 2013. ↑ Coro, Paul (June 19, 2008). "Suns fill out coaching staff". The Arizona Republic. Retrieved May 3, 2012. ↑ . Retrieved June 16, 2015. ↑ Coro, Paul (July 1, 2008). "Cartwright a big-man coach, more". The Arizona Republic. Retrieved May 3, 2012. ↑ Coro, Paul (December 30, 2010). "Suns Extra: Q & A with assistant coach Bill Cartwright". The Arizona Republic. Retrieved May 3, 2012.